In collaboration with the FeuerTRUTZ Network, Rudolf Hensel GmbH has revised the BRANDSCHUTZ pocket ‘Summary of fire protection coatings’ for the second time, extended it and published it for the FeuerTRUTZ 2017 in Nuremberg. The BRANDSCHUTZ pocket in postcard format contains 28 pages of concise information which is always to hand on the use of fire-protection coatings in passive constructional fire protection. 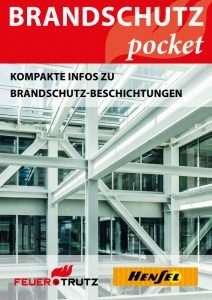 BRANDSCHUTZ pocket is again available as a PDF for downloading. We will be delighted to send you a printed copy and/or further copies for your colleagues, but this offer is available only as long as stocks last! Please send an email to contact@rudolf-hensel.de and state the number of copies you require, your first and last names and your address for delivery.